This is an introductory article to two articles we will feature from our salesmen who will be doing new builds in the near future. We will feature these on our web site and also provide a link to them in Facebook. There are many hobbyists that do not plan their new tank carefully before starting the build. This usually leads to an insufficient size tank for what they want to keep and/or inefficient components to properly do the job. When planning a new reef tank, thought should be given to the types of fish and coral that you wish to keep. Haphazard planning usually results in incompatibility or alleopathy issues generated by keeping animals too large for the system, or animals incompatible with each other. Other issues can involve using undersize filtration components to do the job. We will start by choosing the proper tank for your application. This is likely one of the greatest decisions you will be making and one of the most important. Review your budget first to allow enough money to complete the system with components properly sized to do the job. Too many failures have resulted from hobbyists wanting 200+ gallon tanks to impress their friends but found their budget was lacking to purchase components capable of doing the job as well as stocking the tank for an attractive appearance. The outcome of a plan like this generally results in a tank crash very quickly. Choosing a location for your tank is of utmost importance as this usually determines the size of aquarium you can use. Tanks with a larger surface area per gallon are recommended as they offer a much better gas/air exchange than tall narrow tanks. Tall tanks are also more difficult to clean. Choose an aquarium with a built in overflow to allow the use of a sump. 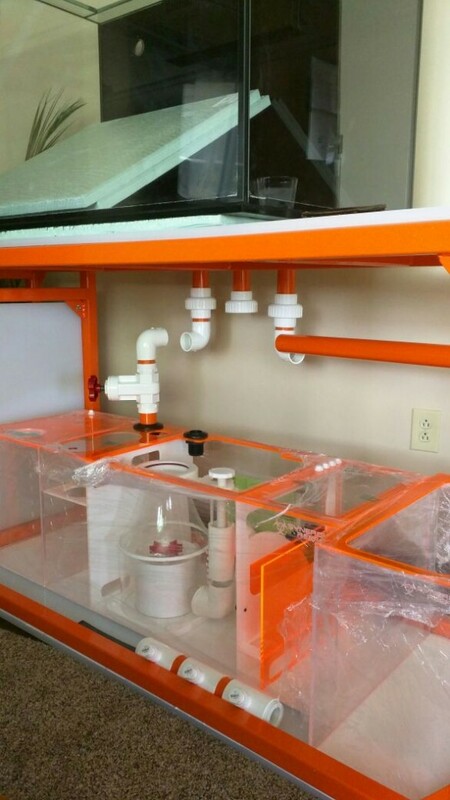 Sumps add more total water volume to the tank and offer a place to put your protein skimmer and other accessories you may want to use such as reactors, skimmer, heater and probes. Choose a sump that has a controlled water level in the skimmer chamber. Well designed sumps will offer an adjustable gate to keep water level in the skimmer chamber at a constant level. Choose a sump that has a controlled water level in the skimmer chamber. 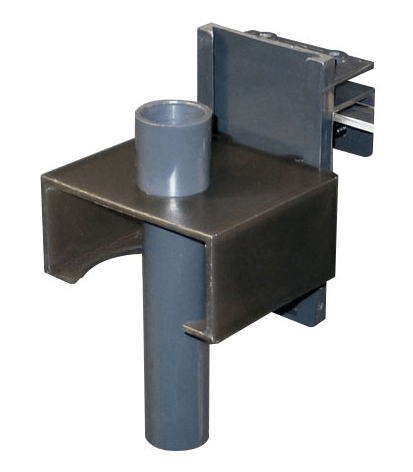 Well designed sumps will offer an adjustable gate to keep water level in the skimmer chamber at a constant level. 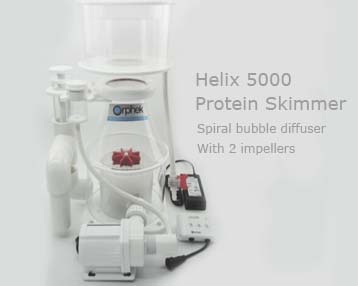 A good protein skimmer will be most efficient when the water level remains constant. Fluctuating water levels in the sump generally result in foam not entering the collection cup or foam overflow. Purchase a skimmer a sump that has filter socks which can easily be removed. Filter socks trap waste from re entry to the tank and help polish the water. There are accessories available that will allow you to add a filter sock to a sump. These are usually clamp on or magnetically held devices. A good rule of thumb is to select a sump with a volume of at least 20% the total tank size in water volume. The safest way to determine the size of your sump is to measure the distance from the water level you wish to keep in the tank to the bottom of the weirs in the overflow. Let us use a 48”x24”x24” tank (120 gallon) for an example. If the distance from the water level to the bottom of the weirs is two inches, then we calculate the amount of water this area will contain. 2x48x24=2304 cubic inches \ 231=9.97 gallons. We will have approximately 10 gallons of water going into the sump should a power failure occur. Now it is best to double this number so the result will be a sump of 20 gallon capacity which is 24% of the tanks volume. It is also recommended to keep the return lines to the tank above the bottom of the weirs to prevent back siphoning or to drill a small hole at the top of each return to allow air to break the siphon if a power failure should occur. A return pump should be sized at least 12 times the volume of your tank. Other factors to consider is if the return pump will also supply water to other devices such as carbon reactors or UV sterilizers. This will require a higher flow rate. For installations such as this a water manifold with ball or gate valves is recommend for flow control. External pumps are more expensive than internal pumps but the advantage is they save needed space in the sump for other accessories you may use. 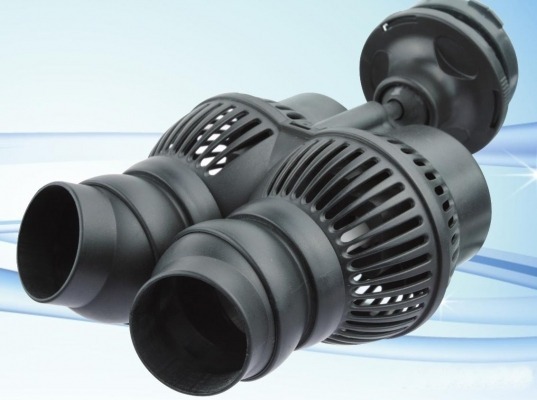 They are very efficient heat reducers as most are operated by magnetic impellers therefore reducing any heat to the aquarium by a considerable margin. For internal pumps, choose a pump with the lowest wattage per gph. This helps to minimize heat in the aquarium water. Head pressure loss must also be considered when selecting a pump. If you calculate your pump size to be 800gph, a pump with 800gph at 0 head is not much use if at a four foot distance it drops to 600gph. Always consider the height or distance your pump must supply water to when calculating this. Elbows and T’s also reduce water flow and must also be considered. Most experienced hobbyists will select a pump larger than what is needed as ball valves can be used to control flow without causing any damage to the pump. Wavemakers are a necessity in reef aquariums. They help keep debris off the coral and minimize waste from settling in otherwise dead spots in the aquarium. Since there are a plethora of these devices available to the hobbyist, it is best to do research on models before selecting. The best recommendation is to visit forums and ask for cons and pros about models before making your decision. Your budget will play an important part in your decision making. Good reliable wavemakers and controllers are not cheap, they can range from $200.00 to well over $600.00. Again there are many brands to choose from in this category. Care should be taken to ensure the salt mix you choose will provide all the major and minor elements for your application. One of the most important items is continuity of the element mix from bag to bag; will the bag you buy today have the same exact element mix ratio as the bag you buy three months from now? Some brands are notorious for consistency. Here is another area where you can learn much from visiting the forums. 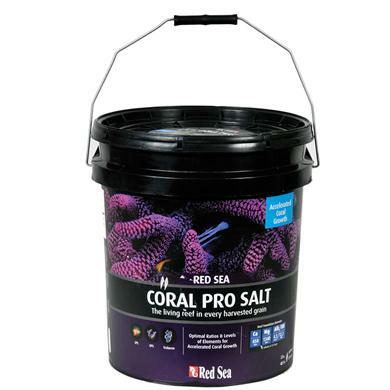 Most quality mixes advise you to mix only with R/O water as the calcium and magnesium levels are elevated for use in reef tanks. Hobbyists with high calcium levels in their tap water will experience higher levels of calcium in the tank water. Our best recommendation is to use a quality R/O water purifier and preferably with a DI unit. Look for units containing a membrane with a high rejection rate. Units with built in pumps can also save you money on water use. Homes with water systems under 45psi will also benefit from units with pumps. DI units with color change indication are also beneficial as it is a warning to change the resin in the unit. Another very important component of a successful reef tank is the protein skimmer. There are in sump and external skimmers available. In sump is safer because there is no danger of an overflow problem causing a mess in your cabinet or on your floor. You should always choose a skimmer that is rated for tanks 1.5 times the actual size of your tank. There are many good skimmers available but DC skimmers are much better in terms of pump speed and energy savings. They are also a little easier to fine tune. It is important for the efficiency of the skimmer to clean the collection cup and reaction chamber at least once per week. Recirculating skimmers require a separate feed pump so understand that the cost does not include this. 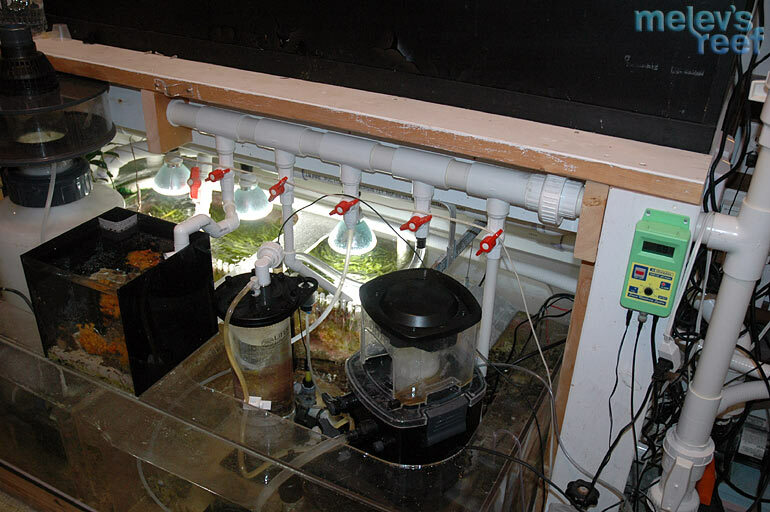 Orphek makes two great protein skimmers ranging for tank sizes from 50 gallons to 600 gallons. Lighting is extremely important for coral reef tanks. Without proper lighting of the correct spectrum and intensity, coral will not flourish, grow and exhibit good color. It will also be one of the most expensive items you will be buying so carefully choosing the right lighting for your system is of utmost importance. 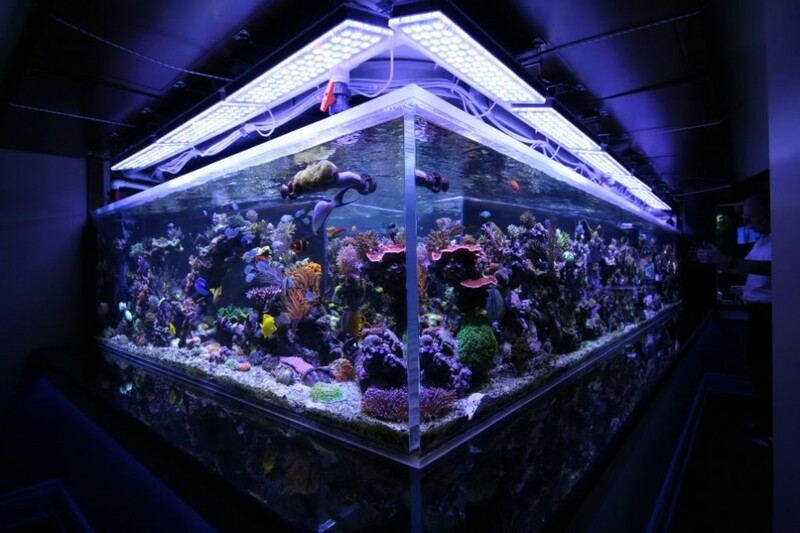 What should you consider when choosing a light for your reef aquarium? Spectrum! This is very important. Coral does not use the entire visible wavelength and choosing lighting with a poor spectrum will result in failure. Intensity! Most SPS coral will need a PAR of 150 to grow and the PAR must be in the correct spectrum. A PAR of 150 in the green area of the spectrum will do no good as coral do not use light in this range to grow. Chlorophyll! The spectrum should also peak in the area which promotes chlorophyll production. Heat! Care must be taken here. Metal halide lighting in shallow tanks will drastically increase the temperature of your tank unless a chiller is used. Another expense. Lamp life! How long will the interval be before lamps have to be replaced? You can figure this in to your maintenance expenses. T5 – An efficient lighting source for reef tanks containing SPS coral providing the depth does not exceed 24” in most cases. Produces heat but not nearly as much as metal halide. Lamps generally have to be changed yearly depending on length of photoperiod. 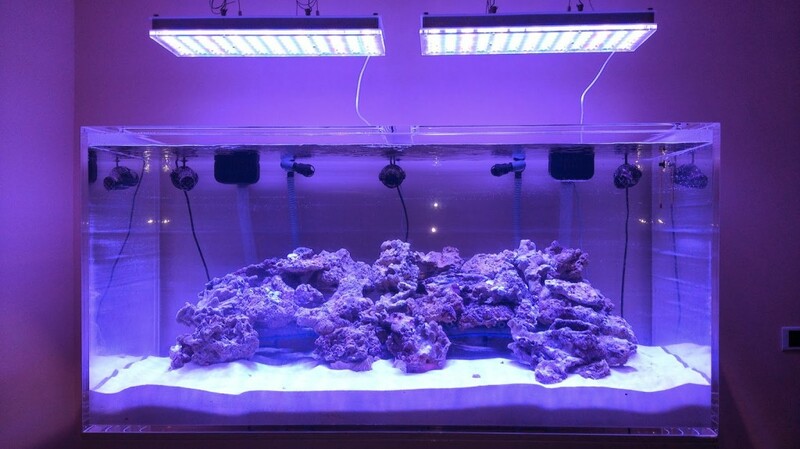 Metal halide/HQI – Considered to be one of the best lighting sources for coral but have serious drawbacks. This technology generally requires a chiller to keep water temperature down which adds another expensive component to your budget. Metal halide lighting cannot be efficiently dimmed. Metal halide lamps have a shorter useable lamp life than other technologies. HQI emits dangerous UV light which require a glass or acrylic filter between the light and water. 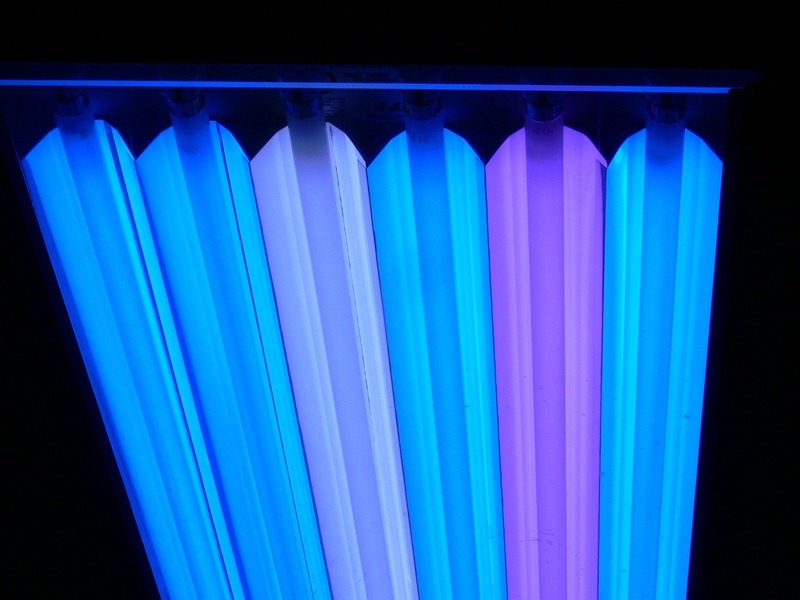 Metal halide and HQI also have the highest energy usage of all technologies. 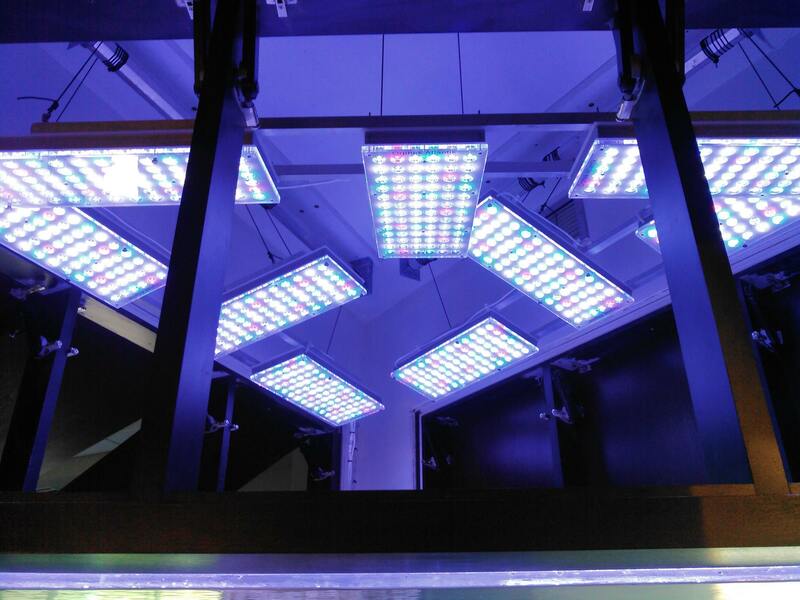 LED – This is by far the most efficient technology for lighting coral reef aquariums. There are many brands to choose from but most cannot effectively light a SPS coral reef tank over 24” deep. 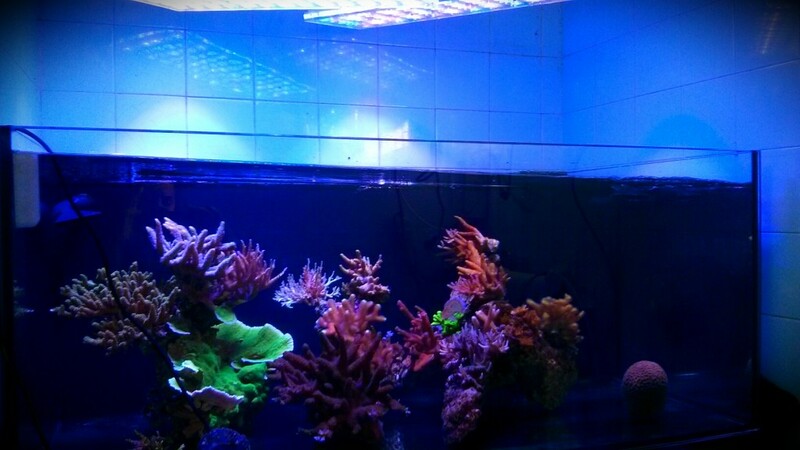 What to consider when choosing a LED fixture for your reef tank. Light spread! There are models with attractive prices but do not provide efficient light coverage over 24 inches. Look for units that provide a uniform spread of light. Spectrum! As stated previously, spectrum is of the utmost importance. Make sure the light you choose has an ideal spectrum for growing coral. PAR! The unit must provide a PAR/PUR of at least 150 to the bottom of your tank for SPS growth. Hot spots! Avoid units that have hot spots as this will effect placement of your coral. Hockey puck style lights can produce hot spots. Wattage! Look for units that do not run the LEDs at their full rated power. LED longevity will be drastically decreased. WiFi! Look for units capable of wifi integration with home networks without having to buy additional components to do so. Want to save yourself a lot of time, choose Orphek LED lighting and all the above will be solved.